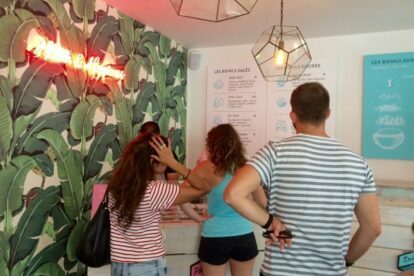 A couple of months ago, I was telling you about my high school friend opening her poké bowl restaurant called Elua in Eaux Vives District (see my article on the topic). Recently, another restaurant with a similar concept opened just a couple of blocks away from Elua. It is called La Esquina. They claim to be a fusion of Hawaiian, South American and Los Angeles flavors. It is owned by the same people who opened ALMA, a trendy fusion Peruvian restaurant (see my article on the topic) about two years ago. They seem to be unstoppable in their quest to transform Geneva into an attractive and exotic cosmopolitan city. It is a great healthy lunch option to take away for a nice improvised picnic by the Lake with your coworkers. They have an attractive selection of sweet and savory bowls to satisfy your healthy breakfast and lunch cravings. I had both the Aloha Bowl at 19.5 CHF and the Zen Bowl at 16 CHF and they were both filling and delicious. I really like the fact that you can pick and put your own sauce on your bowl along with a nice selection of seeds toppings that you can add yourself. The space, while small, has a very trendy urban jungle decoration. It has a few seats in case you want to eat inside, however, in the summer, the place gets hot and suffocating. They also offer a nice smoothies selection. My colleague tried the Green smoothie and she really enjoyed it.